John Tait, a weaver by trade and editor, printer and publisher of the Glasgow Liberator from November 1832 until his death in 1836, is buried in common grave number 2 in Compartment Zeta. He died on the 19th October 1836 aged 41 from typhus leaving five orphaned children (his wife had died only a few months previously) and was buried on 24th October. He received a public funeral which was “attended by at least 2000 persons respectably dressed in mourning” according to newspaper reports. His was the first of 257 interments in this grave between then and 6th April 1840. The Glasgow Liberator, November 1832 to October 1836, was one of a number of short-lived radical newspapers that sprang up in the 1830s during the struggle for Parliamentary reform and improvements to the rights of working men. 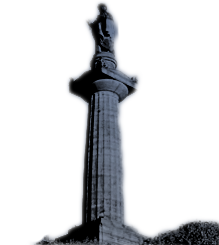 It developed from the Herald to the Trades’ Advocate, September 1830 – March 1831, and on Tait’s death was continued by Dr John Taylor of Ayr under the title of the New Liberator until it folded in 1838. Only a single copy is known to exist. In the months following Tait’s death there was talk of trying to raise money to erect a monument to him and make financial provision for his family. The idea came to nothing and he still lies in a common grave. Tait was a friend of Alexander Rodger the poet and employed Rodger as a general assistant for a period about 1835/6. His country from that power that dooms mankind its slave.